Cleans, shines & freshens in one operation. No need to rinse! Cleans, freshens and shines and will not leave a dull residue. It's safe to use on hard, non-porous bathroom surfaces: Baths, Whirlpool baths, sinks glazed ceramics, toilets, tiles, shower trays, glazed porcelain, chrome & gold fittings, stainless steel, work surfaces, tabletops, chairs, etc. Helps protect your family from germs. Effective against MRSA after only 1 minute of contact time. 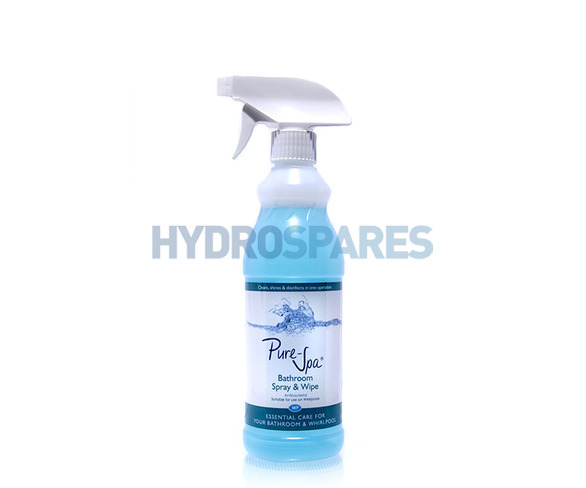 Recommended for Whirlpools & Spa bath surfaces, jets and fittings. Non agressive, non abrasive - does not contain acid, bleach or ammonia. Do not use on: unsealed wood, eating utensils, plates, glasses. For easy cleaning of your hot tub shell & cover. I love this,easy to use and the smell leaves the bathroom smelling so clean and fresh. Will be using nothing else from now on. Used this for a few weeks now, and removes all marks leaving a squeaky clean surface. This is a fantastic product. It cleans very well without any smears & smells great too. I'm now also using it in the separate shower as well as the whirlpool bath! Highly recommended. Easy to use and leaves the bath surface clean and fresh. Excellent product for making your bathroom super clean by removing all trace of soap scum. Good value too, particularly when you buy in multipacks. Really impressed with the cleaner, very easy to use and smells delightful. Will definitely be buying some more. love the smell!I use it as a general all round bathroom cleaner! Love this antibacterial cleaner. Gorgeous smell in the bathroom. When it came howeve,r the supplied trigger had too long a tube to fit the bottle and had to cut off about 2". it is very hard plastic to cut!